Gigantism of the toes can cause major complaints and consequently a considerable impairment in everyday life for the patients suffering from it. Macrodactyly, also known under the synonymous term gigantodactyly and linked to the Proteus syndrome, is a relatively rare deformity of the toes. Learn more about macrodactyly and how it can be treated in this article. The term macrodactyly derives from the Greek terms makros for “large” / “long” and dáktylos for “finger” or “toe”. The term macrodactyly describes an excessive growth of one or more toes o fingers. Macrodactyly is a special form of local gigantism which usually occurs isolated. The term macrodactyly is only a description of the symptoms since it may have several medical causes. 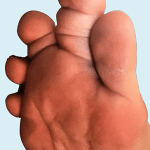 Macrodactyly and the concurrent malalignment of the toes is a deformity of the toes which is relatively uncommon. It is characterized through a disproportional growth of the soft tissue as well as the bones of the affected toes. The excessive growth of a macrodactyly can occur either with the birth of a child (type 1 after Barsky), or occur within the first years of life (type 2 after Barsky). The circumference as well as the length of one or more toes are magnified to many times its normal size. In our practice in Dusseldorf we could already observe a growth up to seven times to its normal size. 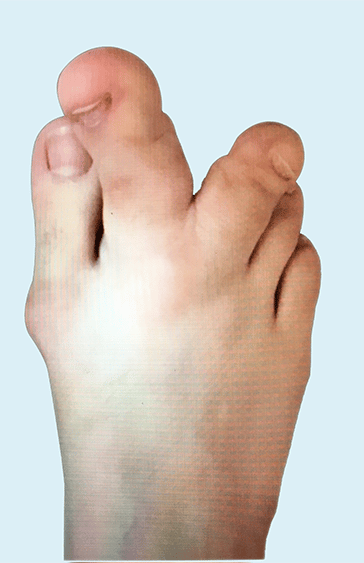 Due to the gigantic toe or toes the other toes man suffer a malalignment and drift to the side or upwards in the direction of the nose. Often a macrodactyly coincide with a syndactyly, where the two enlarged toes are grown together. For the rest of the patients it is also a genetic disorder that is not inherited which causes the macrodactyly. This means it is caused by a genetic mutation, random changes in the genome. One of the possible causes could be he Proteus syndrome which is a mutation of the genomes AKT1 and PIK3CA. Usually the patients need specially manufactured orthopedic shoes. Commercial shoes seldomlz provide enough space for the deformed toes. Due to the enormous size of the affected toes, macrodactyly often leads to a considerable psychological distress and emotional suffering. The feet are often an involuntary eye-catcher for strangers which react with hostility or amazement. Consequently the patients affected by macrodactyly feel stigmatized and try to eschew situations which might draw attention to the feet. This means that spaces where it is necessary or common to walk barefoot (sauna, swimming pools, beaches) are usually avoided. A large amount of patients with macrodactyly develop depressions in more or less severe stages. Which Long-term Damages Can Occur When a Macrodactyly Is not Treated? 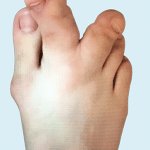 Macrodactyly can lead to severe misalignments of the adjoining toes if it is not treated. This may cause further pain as well as instabilities and posture problems which could affect the health of the skeleton and spine in general. Each patient is different and especially with diagnosis such as macrodactyly there is no standardized procedure. The excessive growth of toes cannot be constrained by conservative therapies, a surgical intervention will become necessary at some point. One possibility is the fusion of the epiphyseal plates, also known as growth plates. This surgery will be performed as soon as the toe of the child has reached the size of the equivalent toe of the parent. If the toe has already reached a disproportional size in relation to the expected body height as a grown up, this method cannot be implemented. 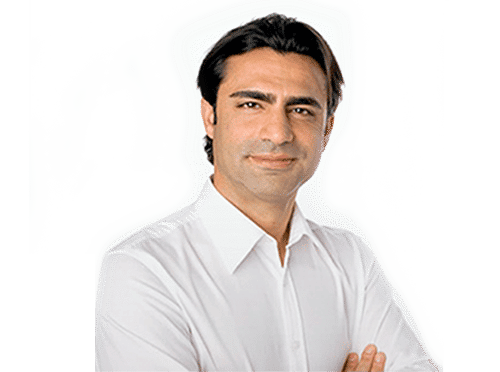 If a corrective surgery for macrodactyly, which will reduce the length and circumference, is necessary, the therapy schedule needs to be planned individually. 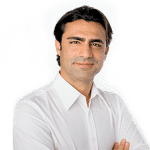 In his practice in North Rhine Westphalia foot surgeon Adem Erdogan prefers a serial method for the correction of macrodactyly. This means that the surgery will not be performed in one stage but in several smaller surgeries with rehabilitation phases in between, reducing surgical risks such as circulatory disturbances, infections and bone healing. Usually a surgery will make corrections either on the soft tissue or on the bones. Macrodactyly surgeries are technically demanding and tedious, it is therefore advised to choose an experienced surgeon specialized in foot surgery. Like the surgery itself, the follow-up treatment needs to be carefully planned together with the patients. The post-surgical care depends mainly on the kind of surgical: was an operation on the bones or on the soft tissue of the deformed toes performed? In general the patient can expect that it will be necessary to wear a special supporting shoe up to six week after the surgery. Post-surgical pain and swelling largely depends on the sale of the surgery. All details will be discussed prior to the surgery. Prognosis – Which Results Can Be Expected After a Macrodactyly Treatment in Germany? The patient needs to understand that no surgeon can perform magic and a new toe will appear, expectations need to be kept realistic from the beginning. The patients also need to be aware of the relatively long treatment period. 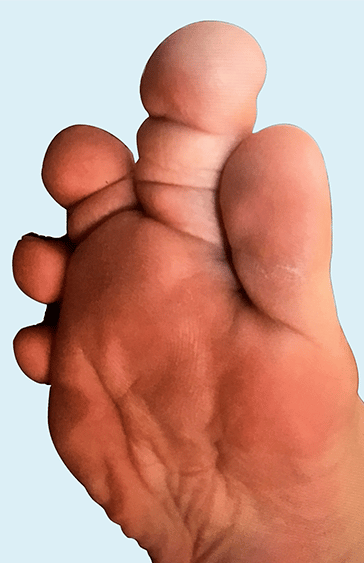 The goal of a macrodactyly correction is a result where the toes look as normal and natural as possible and to enable the patient to lead a life where the toes do not affect everyday life negatively. If the healing process remains without complications, our patients are usually very happy with the result..